I'm running Retrospect 15.6.1 on a Windows 10 Pro 64 system. I use Always Excluded Selector for all the different types of files that I want to exclude from any backup script. Here is the relevant part. The issue here is with the name System Volume Information folder. 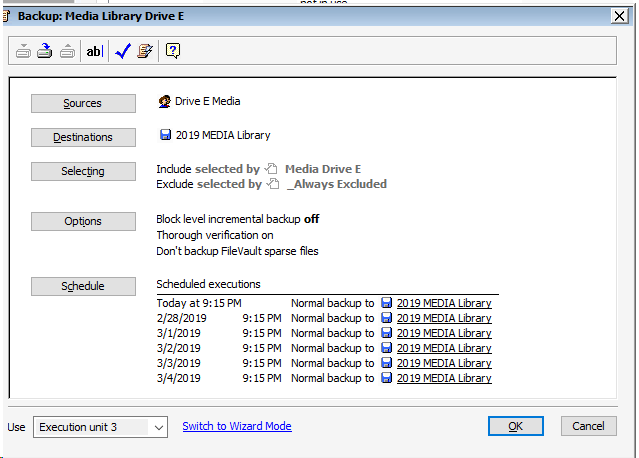 I use this Always Excluded selector for 7 different backup scripts for 5 different backup sets covering Windows 4 drives C-F. For 7 days now, my MEDIA script does back up a 50 GB file contained in the System Volume Information folder. None of the other scripts back up this folder. I can't figure out how to stop my MEDIA script from backing up this folder. It appears that every day, there is a different 50 GB backed up. I thought something might be wrong with the drive, so I reformatted the drive, and then ran the MEDIA script on the now empty drive. Windows never displays this System Volume Information folder. If you use a cmd window, the system shows this directory as empty even though it does contain files. However, the Session Report for the most recent MEDIA script does show files in this folder. So what can I do to stop MEDIA script from including files in this System Volume Information folder? It's a big waste of time and disk space. Again, No other script backs up this folder on Drive C, D, or F, and no other Always Excluded files are backed up by this script or any other script. I believe I can do selective grooming to recover the 350 GB wasted on these files, but that's not a real answer. Very frustrated at this point. In a few days, I will post how apparent bugs in Selector Include definitions have caused a bunch of my scripts to stop working properly when I upgraded from Retrospect 12 to 15.6. You should run the cmd window as Administrator. dir /a:h "system volume information"
This folder is used by Windows for system-level functions. That’s why you can’t access it. Apart from Restore Points, System Volume Information folder also stores the content indexing service databases that are used for faster file searches, etc. I am a Retrospect Mac administrator, as you know, so the suggestion in the next paragraph may not be worth anything. This 2009 thread has something to say about System Volume Information, and this 2018 thread has something to say about the Program Files directory—which seems to be somewhat analogous. What IMHO makes the directories analogous is that they both sound like what Retrospect may define as Special Folders (Windows). That is among the Windows Selector Conditions defined on page 437 of the Retrospect Windows 15 User's Guide. I don't know how to use such conditions in a Selector, so someone more familiar with Retrospect Windows is going to have to advise. But that's OK. I don't want to ever back up this folder. I used the Operating System and Application selector as a source for ideas for my AlwaysExcluded selector. My frustration here is that the AlwaysExcluded selector has been set-it-and-forget-it for several years now, and works as expected in all my scripts except this one MEDIA script starting about a week ago. I have not made any changes to the backup script or to the selector that selects files for backup or to this AlwaysExcluded selector. Here is the full selector. The last four lines are application-specific. Think about what changed about a week ago. Did you update Windows to a new version? Some other change? Here is the full selector. That ends with "Exclude nothing" !!!! You specifically include "System Volume information" in what you want to backup. In fact, you seem to backup "junk" files ONLY. You must have reversed the meaning of the selector. No explicit changes in Retrospect. Desktop APO and Laptop are running Windows 1809. Desktop APH (older system) still running Windows 1803. Ooops. I didn't document well enough. Also I need to add that I back up to 4 different Windows volumes, C-F. This system, APO, and DELOS contain all four volumes. System APHRODITE contains only volumes C-E. The unwanted System Volume Information folder is backed up only on systems APO and DELOS, which are Windows 1809. The unwanted folder backups started on Feb. 12. I didn't make any explicit changes on that date, but Microsoft updates version 1809 frequently in the background or overnight. This folder is not backed up on system APHRODITE, which is Windows 1803. It would not be the first time that a Windows update breaks Retrospect. It often takes months for Microsoft to correct the problems. Is there anything else but System Volume Information that is backed up, that should not be backed up? Have you checked that everything you want to backup is actually backed up? As far as I can tell from a quick inspection of each volume, the only file/folder that is backed up, but should not be, is the System Volume Information folder, and only on the systems running Windows 10 1809. I guess I should report that as a bug to Retrospect. To reply to your second question, I have had an ongoing exchange with Retrospect support about file/folder selector conditions that are part of my Include selector, but that don't in fact automatically select new files to back up. I'm still sorting through all that, and I will both submit to Retrospect and do some postings here when I have successfully gotten all folders properly backed up. In this case, it appears that some selector conditiions are not being implemented correctly. As an example, I have top-level folders 2018 and 2018. 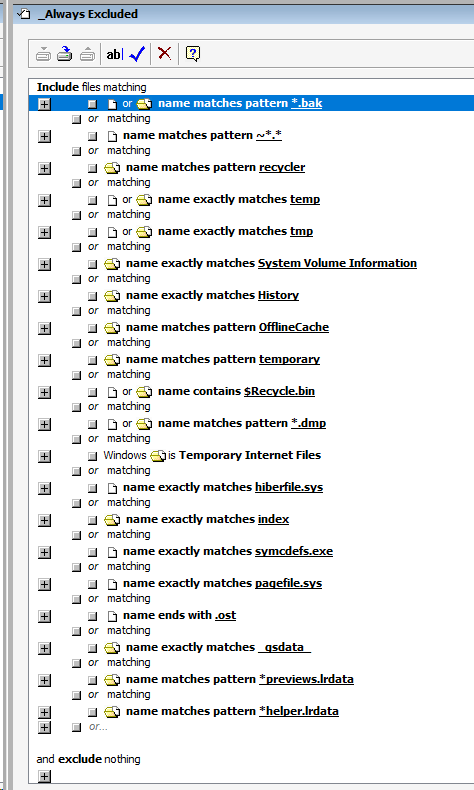 The selector "path matches \2018" does not automatically select files or subfolders to back up. Change matches to matches pattern and suddenly files in folder 2018 do get backed up, so it seems. I still want to run some more tests. In a different script, I have my normal include selector, plus a few specific folder excludes, as well as the exclude AlwaysExcluded selector. Once I finish these tests, I may need to adjust those folder excludes. That is, of course, not suitable for the scripts where you backup a bootable disk. Isn't that to be expected? IIRC, the tip for Windows paths implies you have to include both the drive label and, for directories, the trailing slash. So it should be "path matches E:\2018\".